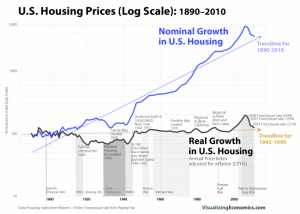 There was a cool chart that caught my eye from visualeconomics.com where they adjusted home values for inflation back to 1890. 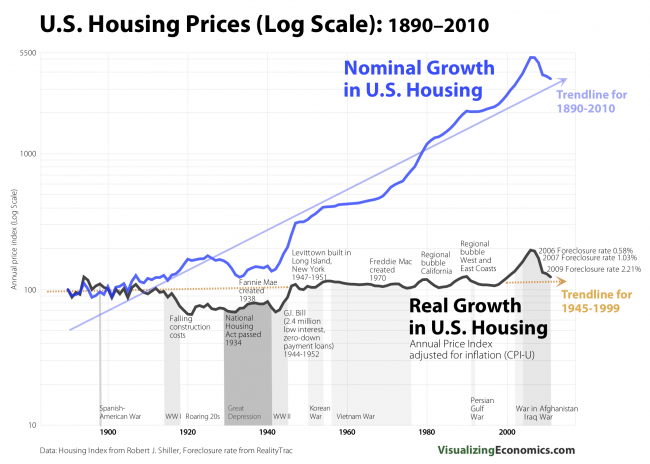 Ignoring the log-scale nominal trajectory, note in terms of inflation-adjusted dollars (REAL dollars), housing is flat – for over a century. There were some good buying and selling signals along the way, but each time, housing reverts to the mean. While this is common knowledge amongst many in the finance world, Americans that saw their home prices double during the prior decade and then sold prior to the crash may find this hard to fathom. If anything, it demonstrates the simple mantra that personal residential real estate isn’t a great “investment”. It’s about a break-even proposition when considering inflation. There are always factors like having a place to call your own, being able to replace a carpet or hang a painting, or getting a mortgage interest tax deduction, but if you’re buying a home with dreams of striking it rich, reversion to the mean like this undeniable silver arbitrage play will bring you back to earth eventually. It’s tough to ignore the massive divergence from the trendline in both the Real and Nominal terms, but like many market mirages, people tend to reinforce their false sense of bravado with “this time is different”, kind of like how US equities are headed off a cliff if and when P/E ratios revert to the long-term mean. For disclosure, I’m a homeowner and I wouldn’t have it any other way. I can’t imagine renting with a family my size and not being able to do what I want to my home. But I don’t consider it to be an “investment”, a nest-egg or a college fund. It’s a living expense. When factoring in upkeep, taxes and the mortgage, it’s not guaranteed to be a good investment by any means. So, if you want to be a homeowner, buy a home. If you want to be an investor, invest in rental real estate over personal residential real estate. Time to Start Leveraging Up Again? It’s interesting how data can expose “investment” myths. This probably doesn’t even take into account upkeep, replacing/updating things, etc. Home ownership is expensive, and shelter is a cost center – looking at it in purely financial terms. Staying flat over the years in terms of inflation-adjusted value says it all! Fascinating. I can’t actually believe it! I’ve owned about 6-7 houses, have ours on the market now, and are looking to buy in another geographic region. I agree, it’s a place to live, not an investment…. but, I always hope to make a capital gain on the sale anyhow 🙂 . Perhaps a house hasn’t increased in real terms, but we’re living in a nominal world baby! I’m a owner (well, the bank still owns more of it than I do ;)) but I’m under no illusions that it’s a way to greatly increase my wealth especially since prices in Canada are high to begin with. I guess over the long run it makes sense if land values trend upwards with the expansion of population and economic output, but homes themselves should decrease over time. A house doesn’t last forever and as they get older they eat a LOT of money in maintenance and repair. I wonder what the graph would look like if you also took that into consideration. I don’t count my primary residence as an investment either. It’s hard to believe the trend is so flat. I’m sure location also matters a lot. Great article; this is what I take away from it. If you buy a house at a reasonable valuation for living it will keep up with inflation AND provide a home for your family. That’s not investing; that is practical and sound personal finance for your family. If you are buying for an investment you should have a completely different set of standards and qualifications. Buying at the right price and cash flow are the keys. That may mean avoiding real estate for long periods of time and investing your money in other asset categories. Previous post: People Aren’t This Stupid, Are They? Next post: Life Settlement Investment – Scam or Legit?